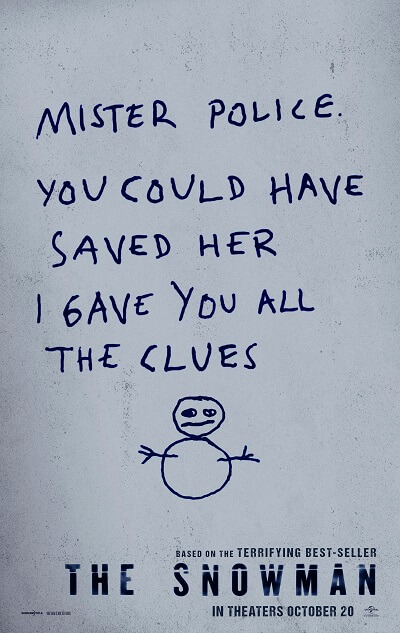 A new trailer along with a teaser poster have arrived for the thriller, The Snowman. The film’s based on the novel by Jo Nesbø and was adapted for the screen by Hossein Amini (47 Ronin, Drive) and Peter Straughan (Wolf Hall). Tomas Alfredson (Tinker Tailor Soldier Spy, Let the Right One In) directs and Michael Fassbender stars in the October 20, 2017 theatrical release. The cast also includes Rebecca Ferguson, Charlotte Gainsbourg, Val Kilmer and J.K. Simmons. Tim Bevan, Eric Fellner, Piodor Gustafsson, and Robyn Slovo produced, with Jo Nesbø, Niclas Salomonsson, Martin Scorsese, Tomas Alfredson, Liza Chasin and Amelia Granger executive producing. The Plot: When an elite crime squad’s lead detective (Fassbender) investigates the disappearance of a victim on the first snow of winter, he fears an elusive serial killer may be active again. With the help of a brilliant recruit (Ferguson), the cop must connect decades-old cold cases to the brutal new one if he hopes to outwit this unthinkable evil before the next snowfall.